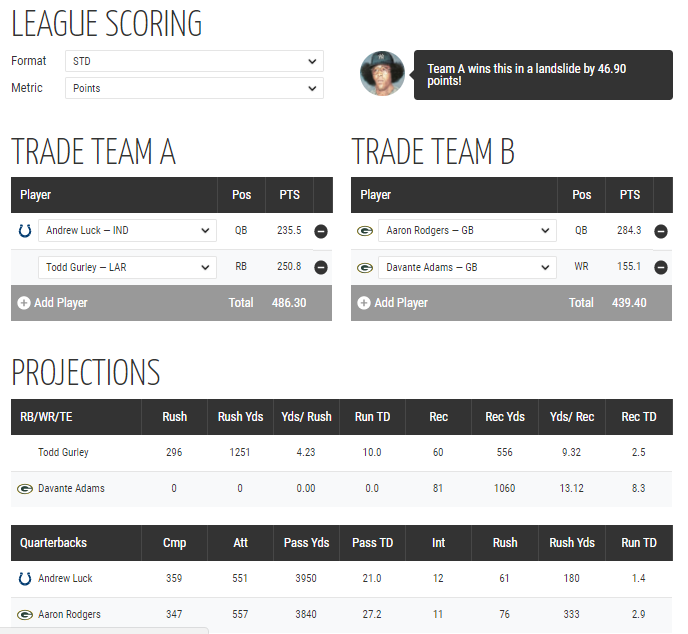 Razzball now has a fantasy football trade analyzer! and it is free! What makes ours worth using vs the other trade calculators out there? We show the projected points AND the actual projected stats of the players in the tool vs just a projected point total. Our quality Rest of Season projections are updated daily throughout the season and frequently in the preseason. Easy to use on desktop or mobile with autofill on player names and auto-calculating totals. Accommodates STD/0.5 PPR/PPR and you can modify display for Total Points or Points/Game. If you like it, share it, check out our fantasy baseball trade analyzer, or, if you are anxious to show your appreciation, you can sign up early for our in-season weekly fantasy football projections/tools!